You can tell when someone has the right job and is living the right life. People like Hofsas House Proprietor Carrie Theis exude an easy happiness. She welcomes guests with a genuine smile and asks if there is anything she can do to make your visit to Carmel by the Sea more pleasant. She doesn’t do this because it’s the right thing to do and it will ensure guests return here year after year, although that is the result. She does it because she’s passionate about Hofsas House, a Bavarian-themed inn established by her grandmother, Donna Hofsas in 1947. Carrie takes time to answer any questions about Carmel and nearby Monterey. She recommends restaurants, shops and activities. She does this because she loves these Central Coastal California towns and because she cares. Carrie actually cares about you, her guest, and she wants you to enjoy your time at her family-run inn. Most doors in Carmel, are traditional Dutch doors, which are divided in half so that both halves can open and close separately. 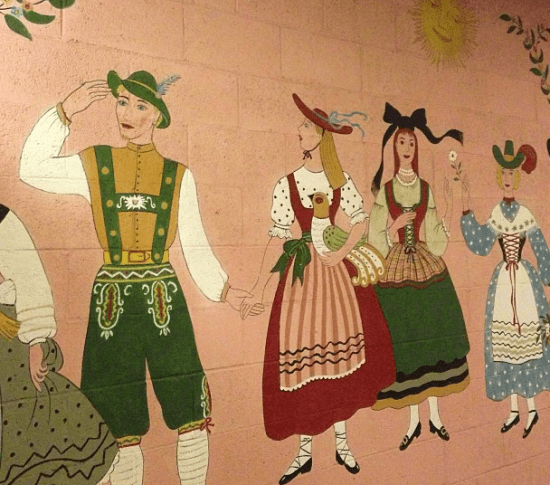 “It adds to the European village feel of Carmel by the Sea,” Carrie explained. It also adds to the welcoming feel of the town. They impart a “come-on-in” feeling. Breakfast is complimentary to Hofsas House guests. Expect simple fare like fresh-baked pastries, yogurt, fresh fruit, juice and coffee, tea, or hot chocolate. 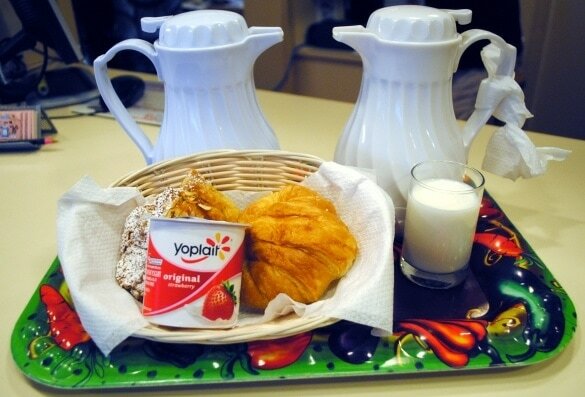 You are welcome to eat your breakfast goodies in the small lobby, but most guests grab their breakfasts on a tray and head back to their rooms. If you are looking for ostentatious luxury, look somewhere else. 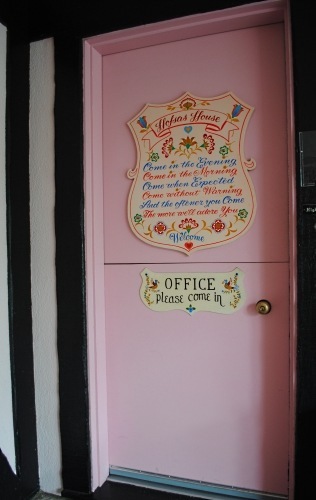 But if you want charm and personal touches aplenty, Hofsas House is right for you. Rooms have a homey feel, decorated with floral accents. Opt for a room with a wood-burning fireplace, if your budget will allow it. With Carmel’s year-round moderately cool temperatures, we used ours every night even though we visited in the heart of summer. If you luck out and happen to visit on a clear day, you will be able to see the ocean from your balcony (or so we’re told). 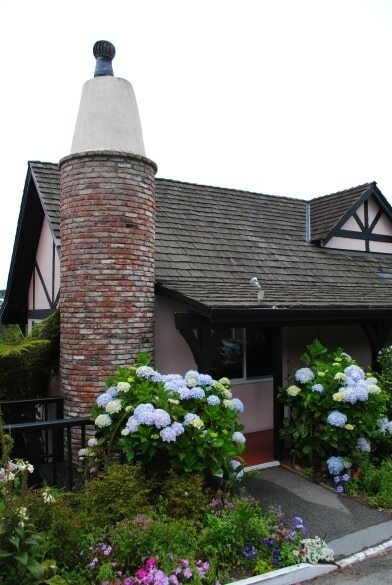 My husband and I celebrated our wedding anniversary at Hofsas House and found the inn and town of Carmel by the Sea a lovely spot to reconnect as a couple away from the hubbub of family life. If you’re celebrating an anniversary or just want to surprise your partner with a little extra romance, book the Romantic Evening package for a rose petal turn down, chocolates, candles (lit with LED lights) and a special keepsake “Do Not Disturb” sign. In addition to catering to couples, the inn encourages families with children to book a stay. In fact, they have a handful of suites that boast separate bedrooms for kids and parents, as well as a microwave and mini fridge. Carmel by the Sea loves dogs, with most restaurants welcoming four-pawed patrons on their patios. Many provide bowls of water and some even offer a doggy menu. After a day of exploring the town, Fido can bed down at Hofsas House. Not all rooms are pet-friendly (due to allergies), but those that are come equipped with a pet bed, a doggy toy and treats. 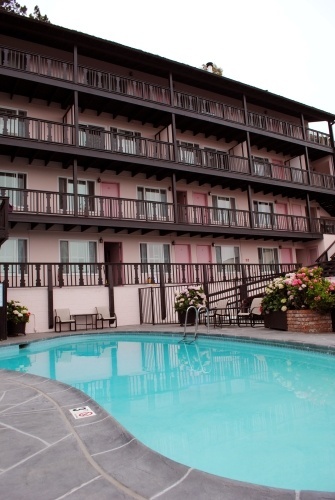 Heated year-round, the outdoor pool at Hofsas House provides a tempting oasis to hotel guests, especially those traveling with children. (What kid doesn’t love a hotel pool!) While there is no hot tub, you can warm up in a dry sauna after your swim. 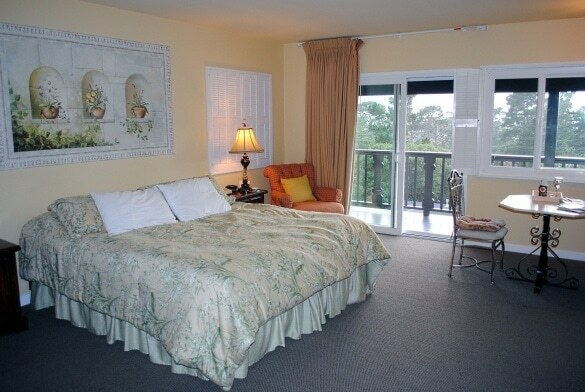 Whether you’re looking for a romantic getaway in Carmel by the Sea, or a family vacation with the kids and pets—the Hofsas House makes a welcoming and memorable option. No wonder the inn’s owner seems content. 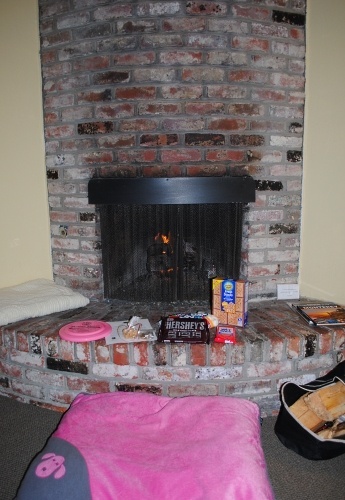 When you travel do you like to stay at family-run inns like the Hofsas House? Let us know in the comments below! A Note from The Travel Mama: Hofsas House hosted a portion of our stay for purposes of this review. All opinions are mine, as always. The owner appears to run her place like a B and B yet the photo looks like it has many more rooms than a typical B and B. Are there 20 or more rooms, like a motel would have? I think this review makes it so inviting that I would love to visit Carmel again. There are a total of 38 rooms and suites at Hofsas House. It’s just the type of place I think you’d love! I have to say our trip to Carmel ranks as one of my all-time favorites, and our accommodations at Hofsas House played a big part. Carmel is a perfect place to reconnect with your wife. The shops, restaurants and wine bars are small and personal. One day after walking through town we got some wonderful pastries and coffee and sat in a small 1-block park to relax…for some reason this simple pleasure sticks with me. I absolutely loved this trip and highly recommend it.